Did anyone else drool over the cupcake spread in this month's Living? My plan is to slowly make my way through these recipes. I started with one a few days ago...of which I'll post about next week. It was delicious so I'm feeling fairly confident in these recipes. If you try any of them, let me know what you think si'l vous plait. I did rip out the page which will most likely sit in my "recipes" file for some time before I attempt it. Yes, please. I can't wait to hear what you think of them... I'm making the chocolate ones tonight. Loved, pretty much love any kind of cupcake, although I think red velvet is my absolute fave! I used the strawberry cupcake recipe for my daughter who requested a pink strawberry birthday cake and it was delicious. Almost more quick bread than cake, but still cake if that makes sense. Those that thought I was wasting a good cake by adding strawberries changed their minds after the first bite. I pieced together an American buttercream frosting with added strawberry puree, cream cheese, and then a pinch of sour cream. It just didn't taste right until then. Because I had been torn between this and leaving the cake plain and serving it with strawberry whipped cream (cream , strawberry puree, sugar, vanilla, and surprisingly a bit more sour cream. It was just one of those days! ), I made that too and served it on the side so we could compare. Surprisingly the combo of the two was perfect, although either one would have been good on its own. How's that for a long first time comment? Holly, it's perfect! I'm happy to know that info about the strawberry cupcakes...they are the most intriguing of the set I admit. 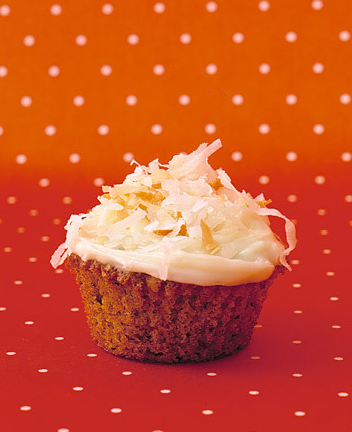 like you, i devoured the coconut cupcake. but you HAVE to try her 7-minute frosting. it's increible.